Uluru-Kata Tjuta National Park is known for nature, museums, outdoors, trails, and classes. Your plan includes some of its best attractions: take your sightseeing to a higher altitude at Kata Tjuta, identify plant and animal life at Kuniya Walk, admire all the interesting features of Uluru, and get outside with Walpa Gorge. Lyon, France to Uluru-Kata Tjuta National Park is an approximately 34-hour flight. The time zone difference moving from Central European Time to Australian Central Standard Time (Northern Territory) is 8 hours. When traveling from Lyon in July, plan for little chillier days and much colder nights in Uluru-Kata Tjuta National Park: temperatures range from 24°C by day to 4°C at night. Wrap up your sightseeing on the 24th (Wed) to allow time to travel to Alice Springs. 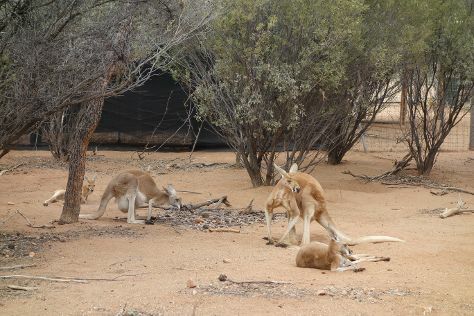 Kids will appreciate attractions like Alice Springs Desert Park and Walking tours. There's much more to do: look for all kinds of wild species at Alice Springs Reptile Centre, contemplate the long history of Alice Springs Telegraph Station Historical Reserve, get great views at Anzac Hill, and explore the striking landscape at The Emily and Jessie Gaps Nature Park. To see maps, where to stay, reviews, and more tourist information, read our Alice Springs road trip planning tool . Traveling by combination of flight and taxi from Uluru-Kata Tjuta National Park to Alice Springs takes 2 hours. Alternatively, you can drive. In July in Alice Springs, expect temperatures between 24°C during the day and 3°C at night. Finish your sightseeing early on the 27th (Sat) so you can travel back home.